Donate and get your PINZGAUER GOODIES here! - THE PORTAL HUB - Pinzgauers, Haflingers, Volvo 303s and more! I think Austrian, Swedish and German 4x4's are the coolest machines on earth. I run this forum as a hobby and it takes my personal time and money. Click on the ad (top/right) if something catches your eye. They send a small payment yearly, based on ad clicks. Tell Scott at Expedition Imports that you saw his ad here; he sponsors the site annually! Or there is a paypal "Donate" button near the top of each page. You pick whatever you want to send. And the last option: BUY A HIGH QUALITY VINYL STICKER OR FRIDGE MAGNET! Non-US buyers: add $2 for postage and use the donate button at the top of the page; just make a note in the payment about which item you want. 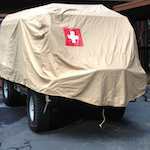 Re: Donate and get your PINZGAUER GOODIES here! Yikes! Years almost over, just kicked in my voluntary "Annual fee"
more error than trial That's worth a lot to me so I contribute.